Astronomers and astrophysicists are making revolutionary advances in our understanding of planets, stars, galaxies, and even the structure of the universe itself. The Decade of Discovery presents a survey of this exciting field of science and offers a prioritized agenda for space- and ground-based research into the twenty-first century. 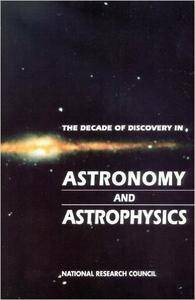 The book presents specific recommendations, programs, and expenditure levels to meet the needs of the astronomy and astrophysics communities. The technological investments needed for instruments that will be built in the next century. The importance of the computer revolution to all aspects of astronomical research. The potential usefulness of the moon as an observatory site. Policy issues relevant to the funding of astronomy and the execution of astronomical projects. The Decade of Discovery will prove valuable to science policymakers, research administrators, scientists, and students in the physical sciences, and interested lay readers.